The world of cinema is constantly changing and evolving, but many people are still in love with the nostalgia of the early days of Hollywood and the silver screen. However, no matter how breathtaking they are, traditional cinemas need to maintain its full functionality. This is where refurbishing a traditional style cinema comes in. The art deco era of the 1920s and 1930s saw some of the most stunning cinemas and auditoriums being built. Many of these buildings still remain today, but maintenance can be a problem. Without proper care and attention, it’s all too easy for these beautiful buildings to fall into disrepair. Refurbishing a traditional style cinema can seem like a daunting task, and it’s important to plan how best to retain the original character of the building. It’s also vital to consider venue safety: your cinema will need to conform to today’s building codes and safety regulations. Shabby seating can let a venue down since this is where your patrons are going to be spending their time, so updating these with the latest seating solutions is imperative. Creating the right appearance for your art deco cinema is important, but functionality is crucial. The screen and acoustics need to be up to date. Acoustic curtains and panels can be customised, which is useful in an older building with unusual architectural features, as you don’t lose the venue’s character. Finally, the screen is the focal point of any cinema, so if this all-important piece of equipment isn’t up-to-scratch you’ll be fighting a losing battle. 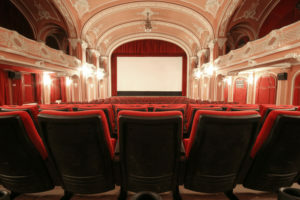 There are different types of screen surfaces and screen frames available, so it’s a matter of choosing the right ones for your cinema. If you’re not sure about which ones are right for you, it’s best to speak to a professional who can talk you through the various choices.